The local EV group is putting together a group buy on some GBS 100ah batteries, so that fast forwarded my battery configuration planning. So far, I'm planning for 125-150cells. A co-worker asked today where I was going to put the batteries. 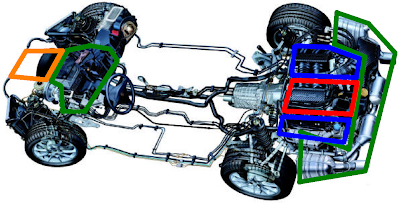 Below is a diagram that shows the desired placements. I purchased some cardboard boxes the size of the batteries to test fit the batteries in the multiple cavities I intend to use. The green section in the front is the former location of the gas tank which holds about 64+ cells. The rear green section outlines where the muffler system used to reside. The muffler space holds roughly 28 cells. The remainder of the cells will fit in the blue sections along the sides of the red motor placement. The front orange section is actually the 'trunk' of the car which is the last place I'd consider mounting cells if I find I need additional cells in the future. What will be the cumulative weight of the batteries (not counting the mounting system)? Each 100Ah GBS cell weighs 6.2 Lbs. So 125-150 cells would weigh from 775 to 930Lbs. I hope to get the car to a net zero weight gain. So far I've pulled out 317 Lbs and removing the engine is an additional 396 Lbs for total of 713 Lbs. I do have to put in an additional 233 Lbs for the new motor plus all the other connecting stuff.